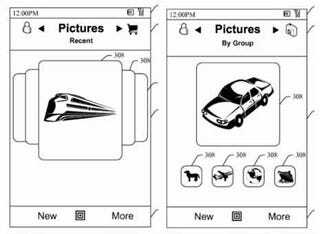 In a patent filed this July, Microsoft wanted to stake their claim to a new interface for use on a touchscreen in a mobile device. The patent, entitled "Extensible filtered lists for mobile device user interface" looks kind of familiar… where have I seen it before? Oh, right. It's the iPhone's exact interface. Whaa? I'm pretty sure Apple beat you to that one, guys. And it's not just the photos/album covers interface, either. Check out this totally unique voicemail interface.